WrestleMania III took place on March 29, 1987, at the Pontiac Silverdome in Pontiac, Michigan. 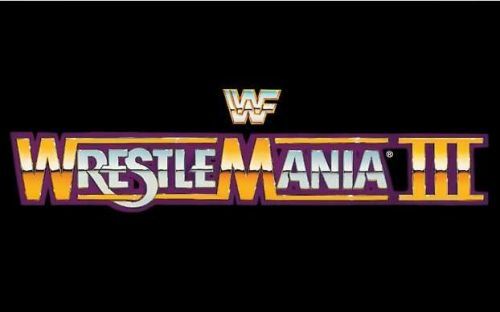 WrestleMania III was the biggest one at that time, as the WWF filled out the entire arena, including the stadium floor, which made for an impressive sight. With 90,000 plus in the stadium, and reportedly another million watching on PPV, making it the biggest WrestleMania (a claim that's often been disputed. In fact, many believe that until WrestleMania 32, the largest ever attended WWE show was SummerSlam 1992 at Wembley Stadium). For the first time, WrestleMania was held in an outdoor arena with the first match of the night being a tag team match between the Can-Am Connection of Rick Martel and Tom Zenk going against the Magnificent Muraco and "Cowboy" Bob Orton with their manager Mr. Fuji. Muraco and Martel started in the ring against each other, with the two trying to lock up several times with no winner prevailing. Martel dominated Muraco before tagging in Zenk and the two teamed up to throw Muraco around. Muraco would then tag in Orton with Zenk dominating the Cowboy. The Can-Am Connection would use a series of quick tags and with their speed, but would also throw Orton and Muraco around despite being the smaller team. The match would break down and all four men would find themselves in the ring. The Can-Am Connection would go on to win after they managed to toss Orton out of the ring and hit Muraco with a crossbody for the pinfall victory. The second fight would be between Billy Jack Hayes against Hercules, formerly known as Hercules Hernandez. Haynes and Hernandez had previously been involved in a "Full Nelson Challenge" in which Haynes challenged Hernandez to lock in a full nelson. Instead, Hernandez's manager, Bobby Heenan, distracted Haynes while Hernandez hit Haynes from behind with a clothesline. Hernandez dominated the start of the match, but Haynes would avoid a corner splash and hit Hernandez with a press slam. Haynes would then attempt to lock Hernandez in a full nelson but Hernandez dived for the ropes before Haynes could lock in the submission. Hernandez would dominate the match for a period before attempting to lock in a full nelson of his own but was unable to completely lock it in. Both men would spill out of the ring, with Haynes locking in a full nelson outside the ring. Hercules would attack Haynes after the match with his chain, opening up Haynes' forehead and making him bleed. Following the match, King Kong Bundy came in accompanied by Little Tokyo and Lord Littlebrook for their six-man tag team match against Hillbilly Jim, Haiti Kid, and Little Beaver. Haiti Kid and Little Tokyo would begin in the ring, with Hillbilly Jim and King Kong Bundy eventually getting tagged in. Little Beaver would frequently get involved in the match, hitting King Kong Bundy on several occasions. Bundy would get his own back, hitting Little Beaver with an elbow drop resulting in Bundy getting disqualified. Bundy would look to hit Little Beaver again but Haiti Kid, Lord Littlebrook, and Little Tokyo would get intervene to make the save. The next match would see the Junkyard Dog facing off against Harley Race in a 'Loser Must Bow' match. Harley Race was wrestling with a King gimmick following his victory in the King of the Ring tournament and was accompanied to the ring by the Fabulous Moolah and his manager Bobby Heenan. Heenan tried to interfere early in the match by tripping the Junkyard Dog, but he still managed to get himself back into the match. Harley Race would pin the Junkyard Dog after hitting him with a belly to belly suplex. After bowing, the Junkyard Dog hit Harley Race with the steel chair allowing him to escape with Race's royal robe. The fifth match on the card was a tag team match between the former Tag Team Champions in the Dream Team of Brutus Beefcake and Greg Valentine against the Rougeau Brothers. The Dream Team had lost their titles a year prior to the British Bulldogs. The Dream Team would be accompanied by their manager Johnny Valiant and Dino Bravo. Raymond Rougeau would start in the ring with Brutus Beefcake, but both would quickly tag in their respective partners. The Rougeau brothers would dominate the majority of the match, with both teams using multiple double team moves. As the referee got distracted, Dino Bravo would interfere in the match allowing for Valentine to get the pin. After the match, Bravo and Valentine would leave Beefcake behind in the ring, essentially kicking him out of the Dream Team. Another gimmick match, this time hair versus hair, was set between Roddy Piper and Adrian Adonis. The feud began when Piper returned to find that Piper's Pit had been turned into the flower shop and that Adonis had hired Piper's former bodyguard, Bob Orton. Adonis then crashed a segment of Piper's Pit with Orton and Don Muraco and attacked Piper. In response, Piper would destroy the Flower Shop with a baseball bat. In the lead up to the match, Piper claimed that it would be his last match in wrestling and that he was retiring from in-ring competition following WrestleMania. Piper would attack Adonis and his manager, Jimmy Hart, during the match. Adonis would eventually take control of the match with the help of Jimmy Hart. Hart would trip up Piper as he hit the ropes, hit him with the perfume, and spray perfume in his face at different stages of the match while Adonis frequently distracted the referee. Adonis and Hart believed that they had the match won after Adonis locked in the sleeper hold. However, as Adonis and Hart celebrated their supposed victory, Brutus Beefcake came into the ring to resuscitate Piper. Piper would then lock Adonis in a sleeper hold and the referee counted Adonis out. Beefcake would then shave Adonis' head while Piper held back Jimmy Hart. Following Piper's emotional victory, the tag team champions of the Hart Foundation teamed with Dangerous Danny Davis to take on the former British Bulldogs and Tito Santana in a Six-Man tag match. Before the match even started, Santana attacked Neidhart after he and the Bulldogs had arrived at the ring while the British Bulldog's mascot Matilda attacked Jimmy Hart. Ironically, most of the men involved in this match would be members of the extended Hart family. With Davey Boy Smith marrying Bret's sister Diana, Jim Neidhart married another one of the Hart siblings Elizabeth, and the Dynamite Kid married Bret's sister-in-law Michelle Smadu. The Hart foundation managed to isolate the Dynamite Kid in the ring, with Bret Hart and Jim Neidhart making frequent tags, even bringing in Danny Davis occasionally. As the Hart Foundation got cocky, Dynamite Kid managed to get his knees up to counter a splash from Davis. This allowed Dynamite Kid to tag in Tito Santana who cleaned, attacking Davis, Neidhart, and Hart. After attacking all the members of the Hart Foundation, Santana would tag in Davey Boy Smith, who would hit Davis with a piledriver, a stalled vertical suplex and a powerslam. Smith would go to pin Davis but the count was interrupted by Neidhart. In the ensuing chaos, Davis would hit Davey Boy Smith with Jimmy Hart's megaphone and would pin him for the victory. Butch Reed would be next up with his manager Slick up against Koko B. Ware with his parrot Frankie. Koko B Ware would use his speed to great advantage early in the bout as he moved around the ring with ease. However, the match would be over very quickly after Koko B. Ware hit Reed with a high crossbody. Reed would reverse Koko's pinfall attempt and grab a handful of tights to ensure that he won. Koko B Ware would try and jump Reed after the bell, but Koko was hit from behind by Reed's manager Slick. This brought out Tito Santana for the save and as Slick escaped, Santana and Koko would attack and double team, Butch Reed. The next match is remembered as arguably one of the best matches on the WrestleMania III card, especially from a technical standpoint. With Ricky 'the Dragon' Steamboat challenging Macho Man Randy Savage for Savage's Intercontinental title. The two had built up the tension as Savage had injured Steamboat by crushing his larynx on the metal railings. While Savage came to the ring accompanied by Miss Elizabeth, Ricky Steamboat was accompanied by Savage's WrestleMania opponent from the previous year, George 'the Animal' Steel. Steamboat would intentionally focus his attack on Savage's left arm. While Savage would target Steamboat's throat, harking back to how Savage had earlier injured Steamboat. The middle of the match saw Steamboat attempt a series of quick pinfalls, but couldn't get more than a one-count on each attempt. However, Macho Man would quickly gain the advantage and would throw Steamboat out of the ring and around ringside. Every so often, Steamboat would build up a head of steam, only to be cut off each and every time by Savage. Steamboat would then pin Savage in numerous different configurations, firstly with a sunset flip, then a roll-up, a reverse double leg hook up, and finally a cradle, but each time not getting more than a two count. The crowd was heavily involved with each of the subsequent pin attempts, getting drawn further and further into the match. Eventually, the referee would be taken out after Savage accidentally sent Steamboat into him with an Irish whip. Macho Man would hit his top rope elbow drop, but with the referee out, there was no one to count the pin. Savage, realizing that the referee was down, went to get the ring bell to re-injury Steamboat. Steel would then interject, ensuring that Savage wasn't able to use the bell on the prone Steamboat. Savage then attempted to hit Steamboat with a scoop slam, only for Steamboat to counter it into a cradle pin for the three-count and the victory. Steel and Steamboat celebrated in the ring together while the crowd went crazy. Following Steamboat's victory, Jake 'the Snake' Roberts was accompanied to the ring by Alice Cooper for his match against the Honky Tonk Man. Roberts would attack the Honky Tonk Man before the referee had a chance to even call for the bell, in and outside the ring. Honky Tonk Man had attacked Roberts with a guitar during a snake pit segment. After Roberts attempted to finish the match early by hitting a DDT, Honky Tonk Man would escape and gain the momentum. Honky Tonk would eventually build towards hitting his 'Shake, Rattle, and Roll' finisher only for Roberts to counter into a back body drop. Roberts would set Honky Tonk Man up for the DDT again but Jimmy Hart, Honky Tonk's manager, would grab Roberts' leg, allowing for Honky Tonk Man to pin Roberts with a cradle pin, holding on to the ropes for the victory. When Roberts attempted to attack the celebrating Honky Tonk and Hart, Honky Tonk would escape, leaving Roberts and Alice Cooper to antagonise Jimmy Hart with Roberts' snake Damian. The penultimate match on the card was a tag team match between the Killer Bees going up against the former Tag Team Champions in Nikolai Volkoff and the Iron Sheik. In accordance with his usual pre-match tradition, Volkoff would sing the Soviet national anthem to a cascade of boos from the crowd. He would be cut off by Jim Duggan and his two-by-four. All four men would start in the ring before the referee could establish some semblance of control. The Killer Bees would make several quick tags, which they isolated the Iron Sheik in the ring. The momentum would eventually swing as Volkoff came into the ring and took control. The Iron Sheik would lock in the Camel Clutch while Duggan chased Volkoff around the ring with his two-by-four. As Volkoff came into the ring, Duggan followed the Soviet into the ring before realizing that he could hit the Iron Sheik. Duggan would hit Iron Sheik with the two-by-four to give the Sheik and Volkoff the victory by disqualification. The final match of the event and the Main Event of the evening was the gigantic clash between WWF Champion Hulk Hogan against Andre the Giant. Andre had not been defeated in singles competition, especially in the lead up to WrestleMania. The match was built on whether Hogan would be able to lift Andre and perform the body slam on a wrestler of Andre's height and weight. Hogan would attempt the body slam early in the match but was unable to lift Andre up. Andre would take control of the bout, performing a series of body slams and stepping on Hogan. Despite devastating Hogan, Andre seemed to prefer to prolong the match as opposed to going for a pinfall. Each time Hogan built up momentum, Andre would cut off Hogan's steam. Andre would lock Hogan in a bear hug for a long period of time, with Hogan eventually 'hulking up' and breaking his way out of the submission with a series of punches. The fight would spill to the outside and Andre would headbutt the ring post to give Hogan some momentum. As they got back into the ring, Hogan would take Andre the Giant off his feet with a clothesline before picking him up and hitting him with the iconic body slam. Hogan would seel the deal by hitting the atomic Leg drop to retain the belt. The Dream Team's place on the car had fallen significantly from WrestleMania II to WrestleMania III. As the Tag Team champions heading into WrestleMania II, the Dream Team would lose the belts at the event to the British Bulldog. At WrestleMania III, Beefcake and Greg Valentine found themselves wrestling against the Rougeau Brothers. The team of Valentine and Beefcake would eventually pick up the victory after Dino Bravo would intervene in the match while the referee was distracted. Despite picking up the victory, Beefcake remained in the ring after the match seemingly upset with Bravo and Valentine. As a result, Bravo and Valentine left Beefcake in the ring as they took the cart back up the ramp without him, signaling the end of Beefcake as a part of the Dream Team, with Dino Bravo seemingly taking his place in the stable. Beefcake would then feud with the team's manager Johnny Valiant in the subsequent months, including teaming up with the Rougeau brothers to face off against Valiant and the new Dream Team of Valentine and Bravo.